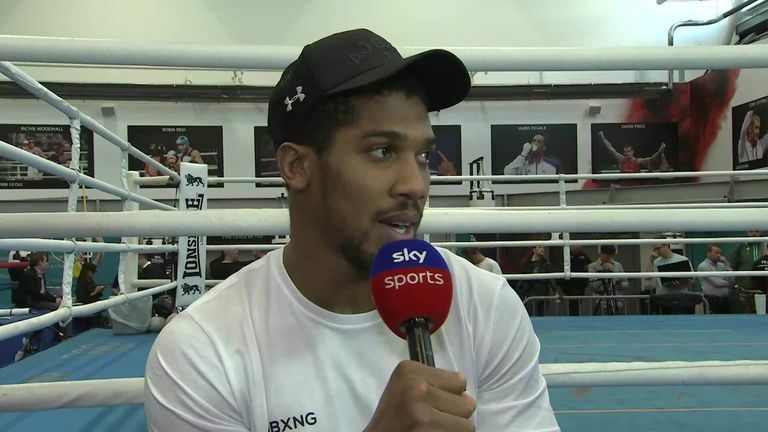 Joshua expects the grit that he is developing in the gym to overwhelm the challenger to his world heavyweight championships, Alexander Povetkin, who he meets on September 22 live on Sky Sports Box Office. I know my sparring partners have the opportunity to get out but [Povetkin] has to stay in, so it will be interesting to see how he survives. "No. They're coming to take my head off because I'm the hunted. "I've become the hunted and I'm well aware of that, and it's made me up my game. This is the reality I live in." Scotland-based prospect Martin Bakole and Agit Kabayel, who has beaten Dereck Chisora, have been notable sparring partners in Joshua's latest camp. "Tough sparring, we do a lot of rounds," Joshua said. "I called it on - I asked for more rounds. I'll never do that again! "We've been sparring the Turks, Germans, Africans, English. Different countries, physicality, mentalities. "I'm world champion right now but I'm still learning from all these guys because they're really talented fighters. I take in what they tell me. "Remember, Povetkin isn't getting out after four or five rounds. He's staying in there with me. Everything I have learned, I will do. "We've been trading heavy leather in these sparring sessions so, if I can do that with Povetkin and he stays in, all credit to him. Because in sparring, after four or five rounds, it gets tough and physical. "I know my sparring partners have the opportunity to get out but he has to stay in, so it will be interesting to see how he survives." "In the Parker fight, there was an air around my name: 'he's tough, he can fight, he can bang, but he'll probably gas out after nine rounds'. "Naturally as a young fighter coming through, you listen to that nonsense. "Parker was a champion as well - 'he's the fastest heavyweight in the division, he's fit, Samoan power'. "I acknowledged that, didn't go in over-confident, was clever and went the rounds to prove it to myself. "They know I can fight - I proved it with Wladimir Klitschko and Dillian Whyte - but in the Parker fight, I proved I could box. I can sustain energy. I can go 12 rounds."